I was involved in rolling out the new HTML5 logo for W3C; I wasn’t the person in charge, but I helped out with some aspects of it. The interesting thing to me was the reaction to the logo, aesthetics aside. (I like the logo personally, but I also like the retro-futurism of Soviet Realist art, like the statuary in Memento Park in Budapest, and comic books.) I loved the parodies and jokes about the logo, but I was both unsurprised and disappointed at the some of the negative dialog (and in some cases, monolog) about what the logo is meant to represent. With SVG being integrated more and more into HTML5, both included via <object> and <img> elements, and inline in the same document, some natural questions about SVG and CSS are receiving more focus. This includes box model questions like background and border, and pointer events. I’m interested in comments from the community on what direction SVG should take. SVG paths have a pretty good set of shape commands, enough to let you draw any 2D shape you might want in an authoring tool: horizontal, vertical, and diagonal straight lines, elliptical arc segments, and cubic and quadratic Bézier curves. Béziers are great, giving you precise control over the position and curve interpolation of each point in a concise format, using control points (“handles”), and are easily chained together to create complex shapes. My last post was slashdotted. Not servers-melting slashdotted, but unusual-volume-of-comments slashdotted. I posted it late on a Saturday night, so I guess they had no other news fit to print. It was interesting, and a little bit exciting, to be linked from Slashdot. I have no great insights, but a few observations. I’m really excited about W3C’s new public Audio Incubator Group, just launched today, and open for collaborators, innovators, and instigators. Go take a look for yourself, and see if you can contribute. I attended Google I/O a couple weeks ago, and had a great time. They really put the “hype” in HyperText Markup Language 5, identifying things like the Geolocation API and some of the WebApps Working Group deliverables as part of “HTML5”. Not quite accurate, but it was a branding exercise, not a technical one. Notably absent from the things they rolled into HTML5 during the keynote, though, was SVG… in fact, they seemed to go out of their way to avoid it. A while back, Henri Sivonen stumbled upon a diagram on the W3C site of the technology stack, a curvy-block Venn-diagram overview of the different technologies from W3C and where they fit into the Big Picture. It’s an attractive diagram, but it oversimplifies things, and shows a decidedly W3C bias toward the Web. It’s clearly been used past its expiration date, and those who consume it might feel a bit queasy. Henri strongly criticized this depiction. He rightfully points out that HTML is not included in this vision (showing XHTML only, which looks a bit silly these days), but then complains that HTML5 and XHR are not included in the diagram. But of course, HTML5 isn’t even in Last Call yet, much less a W3C Recommendation, so it doesn’t really belong in that particular diagram (oddly, Henri credits XMLHTTPRequest to WHATWG, rather than its originator, Microsoft). To keep one foot in the real. So, his diagram is flawed. So what? Why am I picking on it? I’m not, really… it’s a good diagram, and it serves a certain purpose. I’m picking on that purpose itself. Henri was quick to criticize the W3C diagram (on a page where nobody can comment, I note), not because it wasn’t accurate, but because it advanced his agenda to do so (just as the W3C was advancing its agenda by making the original diagram). Data visualization, like statistics or slogans, has a way of territorializing the map, in a kind of graphical gerrymandering. I’m sure that Henri didn’t mean to make such glaring omissions, but I’m equally sure that the creator of the original W3C diagram didn’t have sinister motives either. People get busy, and reuse what they have to hand that meets their needs, even when it’s sometimes not quite correct. I really respect Henri, but what he fails to understand here, or at least to admit, is that different data visualizations are best suited for different audiences and different purposes. He’s shown a clear bias in his diagram toward depicting the “Open Web Stack” (a bias I have to admit I share) and toward desktop browsers (which I find too narrow), with a Web developer audience. That’s perfectly cromulent. But his diagram is not at all suited toward showing the different work going on at W3C, and where it fits in the larger Internet, in an executive summary. Both the offending W3C diagram and Henri’s own diagram are gross oversimplifications… which is the point of data visualizations. The map is not the territory. If I were to make a diagram that encompasses the Web tech landscape, it would include both W3C technologies and technologies from other sources, and code the origins with styling; it would clearly indicate which technologies are open (that is, not proprietary), which are under development and which are stable, and link each node to the definitive resource for that tech; it would not stack them up in a neat little box, but would show the interconnections via lines. And it would serve a different purpose than either of these other diagrams. 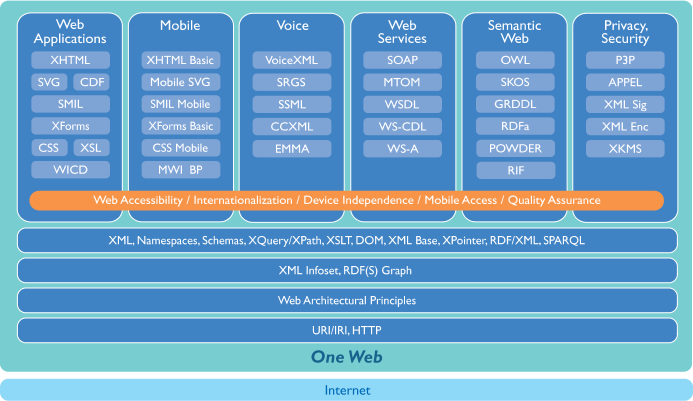 Why was only XHTML included in that W3C diagram, and not HTML? Wishful thinking. Say it enough times, and it just might come true, and a picture is worth a thousand words. We’re all dreaming the Web we want into reality, every day. I’m tired of the false dichotomy that’s too often drawn between W3C and its members and participants. How about we lay off the divisive rhetoric? While answering a question about styling SVG with CSS in the Freenode #svg IRC channel (yes, people still use IRC), I threw together a simple example to illustrate. I like to do this, since in keeps me in practice, and gives me a chance to check the state of current implementations in the fast-changing world of SVG browser support. <rect id="inline" x="50" y="10" width="30" height="50"
<ellipse id="internal" cx="103" cy="35" rx="15" ry="25"
<circle id="external" cx="150" cy="35" r="25"
Please use FF1.5+, Opera 9+, WebKit/Safari3.0, or IE with an SVG plugin! In the SVG WG, we intend to allow authors to reference external stylesheets in a manner a little more modern and consistent with what authors are already used to using, in some upcoming spec. We could do that a couple of different ways. We could allow them to use an xlink:href attribute on the <style> element, in the same way we currently treat the <script> element (that is, if there’s a resolvable external link, we use that, otherwise we use the child content of the element), or we could add a <link> element like X/HTML, or both. I kinda like the idea of allowing either. To that end, I made a couple of tests, just playing around, to see if any browsers accidentally supported either of those options, by merit of having some shared codebase with X/HTML in their implementations. Unsurprisingly, neither worked. With this rather happy result, which works in at least Firefox, Opera, and Safari. I don’t know if this is by design, or if it just fell out of the model, but I have to say I’m pleased as punch that it works. If nothing else, it’s a great proof of concept for adding more ways of linking to CSS in the SVG spec. This one goes in my toolkit, and I’m going to try to ensure that it gets standardized, if it’s not already there in some corner of some other spec. Probably somebody already knows about this (hell, probably everybody does, and I’m late to the party), but for me it was a w00ty discovery.